The sky has completely cleared up. Mars has been slowly moving away from Antares in progression and shining ever more brightly in a ruddy color between Antares and Sagittarius. The sky was transparent, though it is usually hazy in spring. Having completed photographing comets by the 60cm reflector, I searched the eastern sky for about an hour until the dawn using my 12cm binocular comet seeker. I captured M31 in Andromeda at an extremely low altitude in the northeastern sky for the first time in many days. The sky became pale soon after 4 am. Venus had risen 10 degrees above the horizon in twilight sky. It was surprisingly bright. I received email from Mr. Kotaro Watanabe on April 20 that he was the 33333th visitor to my site. I have been presenting commemorative gifts to visitors every 5000 hits. Because a number with five 3s is rather unusual, I will send Mr. Watanabe an autographed copy of my book "Seeking Unknown Stars". Mr. Watanabe, please contact me to give me your address. The reason I think a number with five 3s is special is that there is an interesting place in Kochi City that has many 3s attached to it. 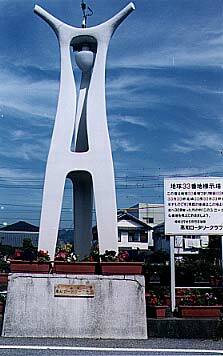 It is located at 133°33'33"3 east and 33°33'33" north, in Enoguchigawa River. Since Kochi Rotary Club erected a monument about 30 years ago, it has become known as "Street Number 33 on the Earth." The precise position for these coordinates is 30 meters north of the monument and in the river. 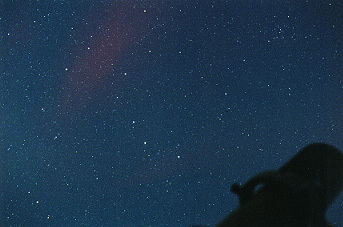 While taking photographs of star fields in the second observing room (Comet Observing Room), I noticed a crimson-colored cloud floating in the northern sky. This glowing cloud moved eastward slowly for about an hour in the Big Dipper. Clouds are generally whitish. Why was it crimson? It can't be a mid-latitude aurora, can it? A long time ago I corresponded with a Yuki Hirota about the stars, an elderly lady living at a place called Hakawa in the town of Ino. She told me that she had seen an aurora-like crimson glow above the Shikoku Mountains during Meiji Period. The photograph was taken with a 24mm lens with a 30-minute exposure. The film was SUPERIA 400. Make the screen display brighter to make the cloud more visible. The moon was bright but I came to the observatory, as C/2001 A2 has been on the rise. Although the moon was a little fatter than a first quarter moon, the sky was surprisingly bright. The comet was barely visible through the 20cm refractor at 60x. The visual estimate of its magnitude was 10.5 and its size 3'. It may brighten a little more. The hill where the observatory stands was lively with blooming cherry blossoms. There were many red paper lanterns hung, ready for flower viewing, down at the parking lot, but there wasn't even a single visitor seen there tonight because it was Tuesday and also cold. Copyright (C) 2001 Tsutomu Seki.